It is one of the best recipes of Paneer that can be served in any party or festive occasion as a starter. You can make the dry paneer tikka either in tandoor or in microwave too. Yogurt and spice marinated Indian Cottage cheese (Paneer) and veggies would become absolutely delicious recipes. It is really very tasty and yummy dish to add in your party food recipes or other celebrations including Diwali menu also. 1. Cut Paneer into square shaped cubes. Also, chopped all veggies in square shapes. Keep the paneer cubes and veggies aside. 2. Take large bowl and add curd. Whisk it till it becomes smooth. Add ginger-garlic crushed and all other spice powders with ajwain and black salt into it. 3. Mix spice powders with curd. If you do not want to brush paneer with oil, you can then add oil in the curd too. 4. Now, add all the veggies and paneer cubes to the marinade curd. 5. Keep it marinated for at least 2 hours or more in the refrigerator. 6. After 2 hours, remove it from the fridge and bring it in the room temperature. 7. Skewers the veggies and paneer one by one on skewers or tooth picks. 8. Preheat the oven at 180 degree C.
9. On a plate or rack, arrange the paneer skewers and brush some oil on the paneer and veggies. Bake it for 20-25 mins at 180 degree Celsius temperature. After 10 mins remove the skewers and turn it. Brush some more oil and keep again in the oven to bake for 10-15 mins more. 10. Arrange the Paneer tikka now on a plate and sprinkle some chaat masala on it. 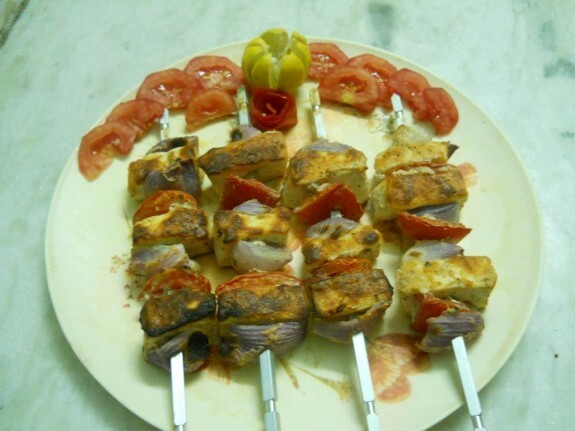 Serve the Paneer tikka with lemon wedges or sliced tomatoes.